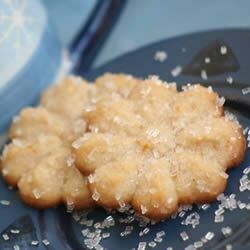 "A wonderful Spritz cookie with cinnamon in it. These freeze very well." Preheat oven to 350 degrees F (175 degrees C). Sift together the flour, salt, and cinnamon; set aside. In a medium bowl, cream together butter and cream cheese. Add sugar and egg yolk; beat until light and fluffy. Stir in the vanilla and orange zest. Gradually blend in the dry ingredients. Fill a cookie press or pastry bag with dough, and form cookies on an ungreased cookie sheet. Delicious and very easy! Dough worked with cookie press nicely. No sticking or clumping.